Dr. Sujatha Ramdorai is a professor of mathematics at TIFR, Mumbia and The University of British Columbia, Canada. Prof. Ramdorai is an internationally reputed algebraic number theorist whose work on Iwasawa theory is widely respected. 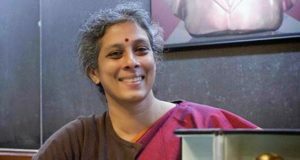 She is the first and only Indian to win the prestigious ICTP Ramanujan Prize in 2006 and is also a winner of the Shanti Swarup Bhatnagar Award in 2004.Prof. Ramdorai was a member of the National Knowledge Commission from 2007 to 2009 and is presently a member of the Prime Minister’s Scientific Advisory Council from 2009 onward.She is also a member of the National Innovation Council. Dr. Ramdorai earned her Doctorate from TIFR Mumbai.